Street vendors hawk arance mafiuse (`fine oranges’) in Palermo and a frisky horse or pretty girl are mafiusi, too; but where does the mafia come in? A true mafioso, if his lips are not sealed by omertá, may say he belongs to the onorata societá (`honored society’) or is un amico (`a friend’) or un amico degli amici (`a friend of friends’), but shrugs off mafia. Omertá, the code of silence, stems from Sicilian omu (uomo, Italian; homo, Latin) and thus connotes `manliness.’ Real men are supposed to settle their own accounts and keep quiet. Informers are despised in many places besides Sicily, but the mafia may dispatch them with a lupara ambush and sometimes with cement overcoats in Manhattan’s rivers. Lupara (from lupo `wolf’) are heavy shotgun pellets (not the shotgun itself, as often mistakenly translated) used for hunting wolves. Someone whose fate is simply to disappear–like U. S. Teamsters leader James Hoffa, a presumed gangland victim in 1975–is said to have received the lupara bianca (`white lupara’) treatment. Protected from such an end by 200 Federal marshals, Joseph M. Valachi made history in language as well as crime in 1963 when he added Cosa Nostra to the world’s vocabulary. Valachi, a convicted murderer who sang about the inner workings of the mob, told U. S. Senate investigators that his crime brothers never said mafia among themselves but called it la cosa nostra (`our thing’). This was news in Italy where cosa can signify just about anything and has multiple idiomatic couplings–cosa pubblica the `State or government’; far le sue cose `go to the toilet’–but where cosa nostra had not theretofore been synonymous with mafia. Italians nevertheless instantly accepted the term as meaning the mafia in America, and it is so identified to this day in the Italian press. Cosa Nostra indeed may qualify as a peculiar American hybrid, U. S. mobsters of Italian extraction having possible antecedents in the Neapolitan Camorra or Calabrian ‘Ndrangheta as well as the mafia. A coincidence, but in U. S. gangland’s hall of fame, Al Capone, was by origin a Neapolitan, Charles “Lucky” Luciano a Sicilian, and Frank Costello (born Francesco Castiglia) a Calabrian. Had Valachi said cosca instead of cosa, he would, curiously, have been using classic mafia coinage. What in U. S. terminology is known as a mafia “family” is called a cosca in Italy, cosca being the `tightly bound leaves of an artichoke.’ Internecine mafia warfare is called a war of the cosche (plural of cosca), while an alliance of cosche is known as a consorteria. The Italian press has also adopted the English gang and clan as variants of cosca. Italian newspapers nowadays like the simple English boss for a mafia leader and use it more than capo dei capi `chief of chiefs’ or mafia don, still beloved of some U. S. writers. A mammasantissima `holiest mamma,’ sometimes used in Italy for the big chief, hasn’t made it yet to America. But uomo di rispetto `man who commands respect’ and pezzo da novanta `big shot’ (from a fireworks display), still appear ritually in writings about the mafia on both sides of the Atlantic. English killers, as in Hemingway’s famed short story, is much used in Italian publications to describe those gangland operatives enshrined in American journalese as “hit men.” A current favorite in the Italian journalistic lexicon is a pentito, (from pentirsi `to repent’), a person who regrets his sins and turns state’s evidence. Besides mafia, the mob in Italy is also known as piovra `octopus’ (its tentacles reaching everywhere), Mano Nera `black hand’ (the famed mark adorning death-threat letters), and the onorata societa. But clearly mafia is an outsiders’ term and not the members’ own label for the criminal group. 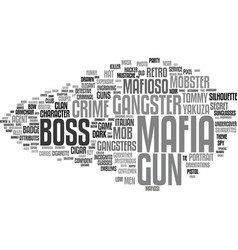 It may be spelled “maffia” as well as “mafia” in Italian; the “o” in mafioso becomes “u” (mafiuso) in Sicilian dialect. One (probably fanciful) version traces the word back to the Middle Ages and the Vespri Siciliani (Night of the Sicilian Vespers), a revolt against French rule that broke out at the hour of Vespers on Easter Tuesday 1282. Mafia supposedly was an acronym for Morte Ai Francesi Italia Anela `Italy wants death to the French.’ Another seemingly far-out acronymic explanation jumps to 19th-century patriot Giuseppe Mazzini and would have it: Mazzini Autorizza Furti, Incendi, Avvelenamenti `Mazzini authorizes thefts, arson, poisonings.’ Another theory is that a mafia was a cave in which the Carbonari, 19th-century revolutionaries, hid. Or, says another theory, Maffia or Maffio was just the name of a founder of the secret society. Giuseppe Pitré, a turn-of-the century scholar of Sicilian folklore, believed the word stemmed from a dialect expression for beauty or excellence–the mafiusi oranges, or horses or girls–acquired the association with manly carriage or bravery, and thence became the name of the secret society. The current Encyclopaedia Britannica traces the origin of mafia as an organized group to Sicilian landowners in Napoleonic times who hired toughs to keep down rebellious peasants. According to this theory, the toughs formed an organization among themselves that eventually became more powerful than the landowners. On the other hand, the Oxford English Dictionary [OED] says mafia connotes a “spirit of hostility to the law” prevailing in Sicily but labels as erroneous the idea of its being an organized secret society existing for criminal purposes. With no such doubts about its existence, some Italian writers capitalize Mafia to describe the secret society and use a small “m” for the state of mind or attitude toward the law. Thus you can be mafioso without necessarily being a Mafioso. The prestige Turin daily La Stampa uses a small letter for both. The Associated Press Stylebook capitalizes Mafia and Mafiosi and defines them as “the secret society of criminals and its members” but adds, “Do not use as a synonym for organized crime or the underworld.” Some Italian-Americans have campaigned against such a synonym, perceiving it as having derogatory fallout for all Italians. In English, mafia has also acquired the meaning of `powerful clique or coterie,’ like the Irish mafia, constituting President John F. Kennedy’s inner circle, or the opinion mafia, applied to pundits of a certain persuasion. Aside from expertise in the extortion and protection rackets–and lately in drug-smuggling activities rivaling those of the mafia–the camorra was renowned in earlier times for the sfregio, a knife or razor cut inflicted on the face of a victim, marking the person for life. A person so scarred was called a sfregiato. Scholars of the ‘ndrangheta–a dialect name for the Calabrian mafia–believe the word may be of Greek origin, deriving possibly from andras `male’ or andraghia `wise men’ or from the verb andragazeo `I act as an honorable man.’ The ‘ndrangheta specializes in kidnapings. The most notorious was the 1973 abduction of oil heir J. Paul Getty III, whose right ear was cut off and sent to a newspaper during negotiations leading to his eventual release for a reported $2.7 million ransom. ‘Ndrangheta will never be loved by headline writers, whose favorite is the three-letter mob. This term has long-time underworld connotations, and was once applied [OED] to gangs of pickpockets working in concert.